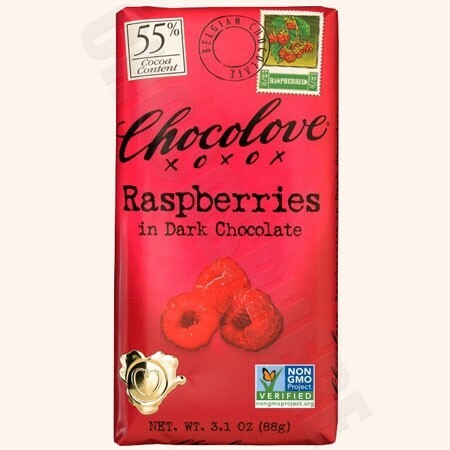 Chocolove Raspberries in Dark Chocolate Bar. Freeze-dried raspberry pieces enveloped in Belgian dark chocolate. Smooth, semisweet chocolate melts in your mouth as crispy bits of raspberry burst with flavor. The initial contrast comes together in a harmonious union, finishing with a chocolate note and a light raspberry finish. Kosher-Dairy, Net wt 90g/3.2oz per bar.